When Assassin's Creed II was announced I knew straight away that I was going to purchase it. I thoroughly enjoyed the original game when I played it in the middle of 2008, but was disappointed that I never took the opportunity to write about it. My anticipation for the sequel running high, I decided that there would be no better opportunity to write about it than now, whilst writing about the sequel. Enlisting a fellow Assassin's Creed fan and my friend, Joseph Rositano, I exchanged some thoughts and discussion about the original game which you can find below. This is part one of an on-going series about the franchise. Steven: First of all Joseph I want to thank you for taking the time out to play and discuss the newest Assassin's Creed game with me. I know you've got a busy schedule with your PALGN work, so let me just say that I appreciate you working with me on this mini-series of posts a lot. Onto the games then, I'd like to start by discussing with you the first game in the series. What did you like or dislike about it? Did anything in particular stand out to you? How did you feel about the setting, narrative and set of characters? Joseph: Hi Steven, I’m glad to be on board for this Assassin’s Creed discussion. I think for me one of the reasons the original Assassin’s Creed stood out was because I had only bought an Xbox 360 a few months prior to playing it. At the time I had barely even scratched the surface of the 360 game library, so the power of the console was still fairly new to me. Ironically Assassin’s Creed wasn’t originally on my “Want” list, but after listening to a podcast I got the impression it offered a unique experience, something which was definitely the case when I played it. When I bought it I didn’t play it right away. To me it was a game that I was going to play when I felt like trying something new, and I was unsure if I would enjoy it or not. But the day finally came when I popped it into my disc drive, and I was instantly taken aback by the opening movie. 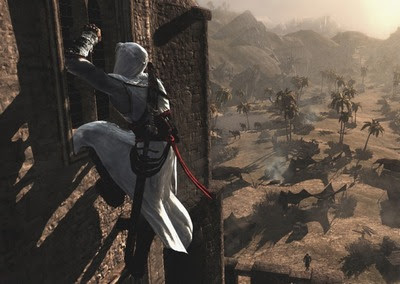 If you can’t recall, it featured Altair running from a group of Templars and escaping them by blending in with a crowd of priests. The visuals alone made we want to dive straight into the action, but it also gave you a modest idea of how the game would play. I’ll go a little more in-depth about my thoughts towards the gameplay a bit later, as I think now would be a good time to talk about the plot and setting. I found it interesting how Ubisoft split the game up into two stories. On one side you have Desmond who’s been kidnapped by Abstergo and is trying to work out what’s going on around him, while on the other we have Altair who starts out as a big-shot Assassin and is then demoted. Of course both parties discover there is more than meets the eye, and the stories quickly intertwine together. I actually preferred Desmond’s story to that of Altair’s. To me, Desmond was the bigger fish of the two as it was already obvious that Altair was successful in completing his mission (otherwise Desmond would cease to exist), so a lot was riding on Desmond and exactly where his place belonged. I also thought the story’s execution was tighter. With Desmond we see him do a little detective work and read emails between various Abstergo staff. It was just a little more unique than what we’re used to seeing in videogames. As for the setting, I’ll be completely honest here and say I had no prior knowledge of the Third Crusade. History usually bores me, yet I was captivated by the world of AC. The thing that did it for me was seeing the scope of the cities and the amount of people that called it home. It was interesting to see how the poorer districts had these tatty run-down buildings while the rich districts featured large monuments that you could see from the other side of the city. Not to mention the beggars who’d ask for money or push Altair around the place. It’s amazing how crazy those times were, and it reminds me how lucky society is to be where we are today. On that note, since playing it I’ve done a little research on the Third Crusade and the countries that were featured in the game. It is inspiring to see how much effort Ubisoft went to in order to be historically accurate, and while not everything is 100%, it’s still a brilliant display. As for the actual gameplay, I loved it. 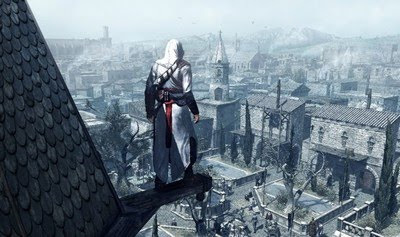 Before AC I had never played a stealth game or anything that had you walk in the shoes of an assassin, so it was quite a unique experience for me personally. I absolutely loved creeping up on guards and then striking them in the back of the neck. CLING! (I loved that sound when you used your hidden blade). I’d then walk slowly away and turned the camera around. I’d see this man suddenly topple to the ground and people started pointing at him wondering what was going on. “Who is responsible for this? !” a fellow guard cried, failing to see the smirk on my face as I high-tailed out of there. It was these moments which inspired me to purchase Hitman: Blood Money and Splinter Cell: Double Agent, the latter of which I’ve regrettably not played yet. 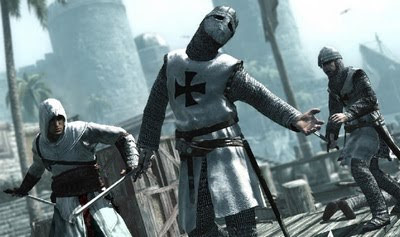 Looking back I can see where Ubisoft potentially drew inspiration from, but it has opened up new franchises to me which is one reason why AC holds a special place in my heart. I know a lot of people didn’t like the gameplay as the missions and combat became repetitive. I too thought it got a little repetitive at times, however, I mixed things up so that I was doing different things. I’d go for the Eagle Dive spots one minute, the next I’d collect flags for a fellow assassin who was in trouble. It prevented things from feeling redundant, but I can still see why people criticised the development decision. Perhaps the best thing about AC was when I finished it I already knew a sequel was well on the way. I wouldn’t have to wait two years like some people to find out what happens next. I wouldn’t go back to the laboratory and stand there gawking at those symbols for hours wondering what the hell it all meant. I instead began to get acquainted with a certain Italian named Ezio, and now I’m just moments away from starting my journey with him. 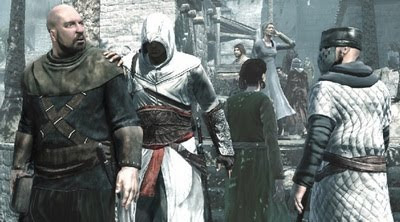 Being Italian myself, I’m particularly interested in the setting of Assassin’s Creed II and how stereotypical the characters will be, but I’ll save my thoughts for our next exchange. 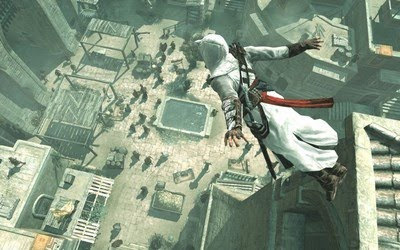 Other than that, all I can say is I’m looking forward to seeing the new direction Ubisoft has taken the series, and from what I can tell the story of Ezio looks to be far stronger than that of Altair. And now I’ll let you take the podium and tell me your thoughts of the original game. Steven: Well it’s safe to say that I share a lot of your thoughts regarding Assassin’s Creed, so it’s nice to see I’m not the only one who took notice of what I’m about to speak of. The elements of the game that stood out to me during my time with it were its mechanics, use of space and the narrative. I have heard a lot of people describe Assassin’s Creed’s combat mechanics as being too easy or too simplistic because players could rely on the X button to win most fights. This is true and I can understand the point, but personally I thought the combat mechanics were very satisfying, so it makes me wonder if these people didn’t engage with them like I did, or if I’m just not as critical as they are? Anyway, you brought up one point as to why I found them so satisfying – the sound as Altair’s sword clashed with an opponent’s, or went in for the final blow. I found the sound effects for the fighting to be absolutely superb, to the point where they were empowering. Your description of sneaking up behind a guard or target and using the hidden blade to take him out stealthily was just plain awesome, the thud as he fell to the ground below putting the final touch on a well-executed, pre-planned attack and bringing a smile to my face. The feeling, great as it may be, never lasts long enough though as the intensity picks up and we are, as the player, required to run for it in hopes of escaping the other guards. With the first few assassinations I almost dreaded this, as I was still getting accustomed to the controls and learning the best ways to high-tail it out of there, lose their line of sight and then find a nice hiding place to rest for a while. As I did it more though, I noticed that I was gaining confidence – not just in my ability to take out my targets but with the pursuing guards, too. I found myself hanging around after an assassination, my sword ready to fight anyone who dared to attack me, and the end result was a different approach that not only worked for me, but complimented the others I had at my disposal (such as escaping and hiding). Plus, fighting multiple guards that have surrounded me, blocking, attacking and countering at all the right moments so my opponents get defeated and I remain untouched is just plain awesome. I thought it was so good that I remember thinking “damn, some other games would be better off if they took their cue from Assassin’s Creed”, but alas, it was not meant to be. The next thing was the narrative and how, as you say, there were essentially two different stories within the same game. As soon as I realized what Ubisoft had done, I immediately thought of the possibilities they could do with it, impressed with the narrative potential they could tap into with the series. The release of Assassin’s Creed II demonstrates some of that potential, but as I’m still early into the game I will reserve judgment until after I have finished it. Delving into it a bit deeper, I agree with you – I found Desmond’s portion of the narrative to be far more interesting than Altair’s, to the point where Altair felt like a simple conduit at times. Sure, we started to find out more about him after each assassination, but even so, I just couldn’t resonate with Altair like I could with Desmond, Lucy and the Abstergo story. Perhaps that is a direct result of my assumptions of where Ubisoft could take it, perhaps not, but whatever it was Altair’s story was just not interesting to me. Whenever I was playing as him, the enjoyment came from the exploration, preparation and act of assassination – everything else was just irrelevant. Meanwhile, Desmond was gradually learning about what was going on, piecing things together bit-by-bit, aided at times by the conversations he could have with Lucy whenever another memory sequence was completed. My enjoyment of the two narratives was definitely at distinct opposites, but as a whole it didn’t bother me too much. In fact, it could even be said it was for the better, as Desmond was providing the story side of things while Altair was covering my sometimes sadistic, sometimes brutal desire to assassinate my foes. It struck a nice balance and is definitely one of the reasons why I liked the game so much. I can distinctly remember the first time I synchronized my first view point in Jerusalem. Having seen it expand out below as I arrived on horseback, and being impressed with how nice it looked, I purposefully set out to climb one of the highest buildings I could find and see it from the bird’s eye view. It was, to say the least, incredible, and I remember sitting up there on that perch for ten minutes just taking it all in, slowly panning the camera to see another side of the city. It was at that moment that I realized just how detailed and incredible Ubisoft’s cities were in the game, and how their use of space was subtle but extremely effective. The best example to this point is one you have already mentioned, the difference between the districts. Walking around the poor district of say, Damascus and coming across the beggars, people struggling to make a life for themselves and the worn and torn houses was remarkable. Visiting the rich district after that and seeing gorgeous statues, monuments and the huge villas was awe-inspiring. The fact that each of the three cities contained their own unique personality was just the icing on the cake. The game’s locations were just cool places to explore, visit and most importantly, be in, and it stands amongst some other games as one of my favourites to just do my own thing and be immersed within the atmosphere. Criticisms of the game from the majority of people were understandable. It was repetitive, the flags could be annoying and as outlined above, it was very easy to just fall back onto the ‘win’ button – the X button – and button-mash your way through the combat. My experience with Assassin’s Creed was a little different though, and those concerns didn’t really bother me at all. I broke up my approach enough that the repetition was rare; I enjoyed finding the flags as it was a nice excuse to explore and take in the environment; combat was brutal and exciting, thanks, in part, to the wonderful sound effects. All in all I’m very pleased that I was able to play Assassin’s Creed, and now, with the release of the sequel, I look forward to seeing what transpires in the continuation of Desmond’s story, as well as the introduction of Ezio’s. Stay tuned for my next exchange with Joseph, this time discussing our impressions of the sequel Assassin's Creed II.